Your clients trust you to deliver accurate Reporting and Insights on a growing variety of marketing platforms. We collect all of the data and deliver Standard and Custom reports to you and your clients, so you can focus on the story and strategy. Agencies have tremendous vision for their clients. Converge gives our Agency Partners the depth and reliability to back up that vision with a technology solution, without building everything from scratch. If you need simple, monthly omnichannel measurement, reporting, and content analysis, we can help make that reliable and standard under our agency plans. If your client pitches require sophisticated, custom, real-time dashboards to win the business, we love to partner with agencies to deliver on that vision. Your clients chose you because you presented a compelling vision and strategy. If that strategy includes consistent, clean, standard analytics, we can help. If you have a custom methodology, we can help your team standardize that custom reporting across clients. 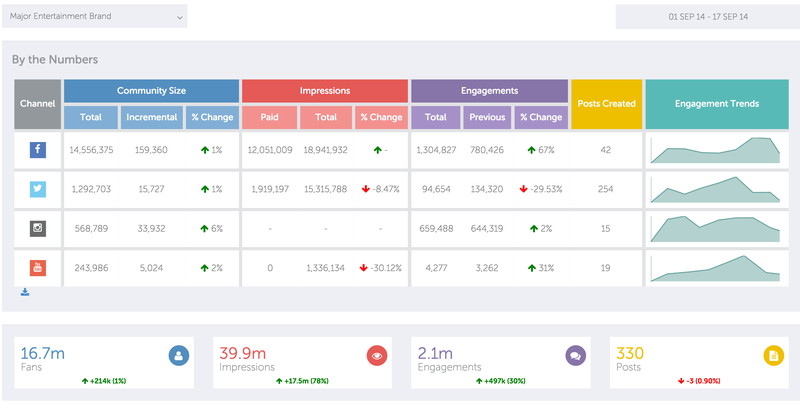 Give your clients real-time access to a current view of their marketing performance, or build your monthly reporting presentation in a flash by grabbing our reports and dropping them right into your deck. Your Analysts and Community Managers can now spend their time analyzing the data instead of collecting it. Sometimes, however, the only solution is to tweak the data in Excel. Our spreadsheet exports give you all of your client's accurate data in well-structured Excel exports, ready for you to sort and pivot-table to your heart's content. What Company are you reporting on? What marketing channels are important to you?